Use simple materials to create a stream right in your classroom. 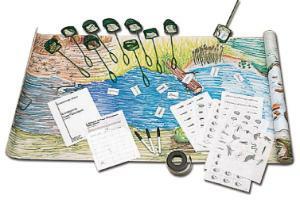 This hands-on lab allows students to explore stream channels, aquatic life, food chains, and pollution. The “stream” is a long strip of paper with laminated organism sheets. Students can identify and classify organisms, determine the health index, take a census, and more. It includes a teacher’s guide and student copymasters. Some assembly is required. Grades 4 - 10.